General Motors builds lots of “incomplete” commercial vehicles that can be outfitted by fleets to be turned into things like limousines or moving vans. Now it’s doing the same for the Chevrolet Bolt, making for an electric vehicle that will become the smallest and most efficient member of this commercial family. According to documents filed with the National Highway Traffic Safety Administration, they will soon start building a model called the Chevrolet Bolt Incomplete. This model is listed in the document alongside trucks and commercial versions of cars like the Cadillac XTS, which can be converted into a limousine. I reached out to GM to get more details on this vehicle, and a representative confirmed that it will be built, saying “This is a new way for fleet customers to leverage the Bolt EV’s incredible range.” They would not share many other additional details other than stating that deliveries to fleet customers will begin later this year. The main modification that is listed in the document is a rear seat delete which will make the vehicle only a two-seater. The document also only lists airbags and seat belts for the front seats since the rear now becomes a cargo area. 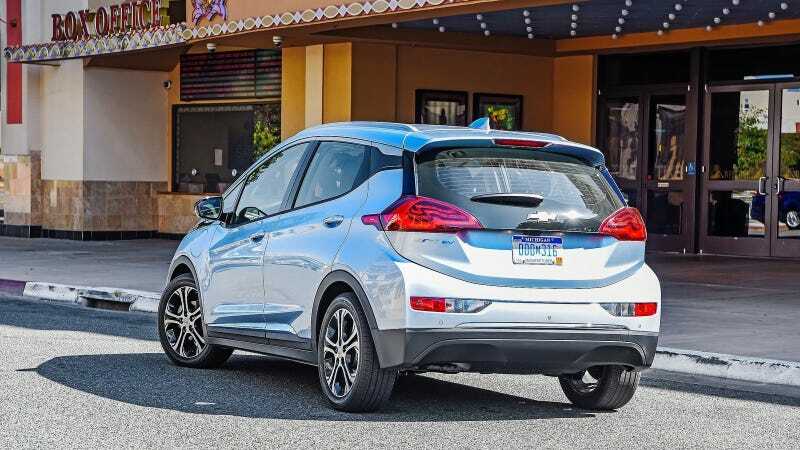 The Gross Vehicle Weight Rating is listed as being between 4,001 and 5,000 pounds and will likely end up around 4,600 pounds as the passenger version of the Bolt is rated at 4,514 pounds. The passenger version of the car comes in at just over 3,500 pounds of curb weight and the incomplete will be lighter with some of the components removed so we can expect it to have a carrying capacity of around 800 pounds or so if we account for the driver. This document states that this new Bolt will be built at the Orion plant alongside the passenger version and will be sold as a 2018 model. Although the Bolt might look odd sitting in their commercial stable alongside large trucks it actually makes perfect sense as a local delivery vehicle. I can see this being used by places like auto parts stores which make short trips around a city and return to base often. This might also mean a return of the Domino’s DXP specialized delivery vehicle that was previously based on the Chevy Spark. Like their other commercial vehicles, this version of the Bolt will likely be light on options so it should come in at a lower price and will possibly be the cheapest version of the car. I expect that range will remain unchanged or possibly slightly increase as it would not make financial sense for them to install a different size of battery pack. It is unclear at this time what other changes will be made to the vehicle but is possible that we might see a resurgence of the panel van look with blocked out rear side windows that we previously saw with the commercial version of the Chevy HHR. Making this model seems like a logical move that should boost sales of the Bolt which has struggled at the beginning of this year after a strong finish in 2017. I look forward to how outfitters are going to customize the Bolt after its release. Update: Thanks to the sleuths at ChevyBolt.org we now have some additional information on this new version of the Bolt. They were able to dig up a fleet order guide that shows some of the upcoming changes. The guide details the airbag changes that we previously discussed and goes on to state that the rear seat delete package will remove the rear seat along with the floor mats, and that it will not be available with certain option packages like the (WPU) Comfort and Convenience Package and (WPR) Driver Confidence Package. It also states that this version of the car will have 16-inch steel wheels that will be wrapped with 205/55R16 all-season tires. The guide goes on to state that the vehicle will be produced in Orion, MI and shipped to Knapheide Truck Equipment in Flint for the build out and then returned to Orion for shipping to the final destination. The latest note on the guide states that the package does not go into effect until March 10, which is likely when the order window opens.